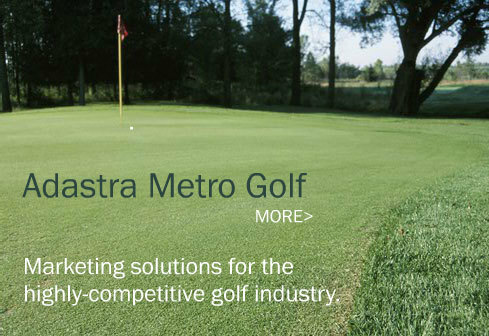 Adastra Metro Golf offers one-stop integrated golf marketing solutions. We deliver products and services that help your company get off the fringe. From email marketing, to loyalty programs, to web sites and traditional advertising, to brochures and other professional marketing and public relation material, Adastra Metro Golf partners with you to help drive customers to your company. Contact us, and we'll outline a solution to grow your business. Or visit our services or portfolio pages to examine our strategy. Affordable. Effective. No two words sum up email marketing better than 'Affordable' and 'Effective.' Let us show you how we can reach 40,000 golfers in the midwest with your message. Learn about our Email Marketing Campaigns.